Is ArsenalLotto a Scam or Legit? Read Reviews! Arsenallotto Exposed — Kick Off Your Luck at Arsenallotto.co.uk! What’s the FA Cup 2014 and lotteries got to do with each other? There is only one answer for that – Arsenal. With so many lotteries operating to benefit education and hospitals, it’s hard not to figure sports would get into the action. Using the German Lotto results, arsenallotto.co.uk runs a betting facility for lottery players bi-weekly. Keep in mind, this is a betting facility and not purchasing lottery tickets. Let’s talk. Arsenallotto.co.uk uses the actual numbers drawn Wednesday and Saturday at the German Lotto. The only difference is, they call their star ball (bonus ball) ‘the Legend.’ It is based on a pic of one of the Arsenal players. The German 6aus49 involves picking six numbers between 1 and 49, and a star (legend) number from 1 to 9. Arsenal Lotto follows the same format with a few other twists. I must confess I did get a little confused in the small print in their terms and conditions on winning even though Arsenal Lotto does provide a heap of examples. The big thing I noted was that if five winners share in the German Lotto jackpot and only three winners in the Arsenal Lotto jackpot, then the Arsenal Lotto players got the same five-way split of the jackpot as the German Lotto. This goes for the other prize levels. Arsenallotto.co.uk also offers two types of syndicates. Their Supporters’ Syndicate is played bi-weekly for £2.50 for access to 100 lotto lines with 100 shares. If you are only playing one time, makes sure you ‘uncheck’ the renewal option otherwise you’re going to get charged for each draw ongoing. There is no option to choose your lines. That goes the same for their World Football Syndicate, next draw 12th July 2014. Buy in on that one for 1,000 lines is £10 with 200 shares available. Each bet placed by a player also gets an entry into a monthly draw. The first prize is a visit to the Arsenal training grounds for 2, second prize is Arsenal match tickets, and third prize is signed merchandise. The Lotto Network owns this lottery (aka MyLotto24 Ltd.) with approximately 26% of each ticket purchased going to The Arsenal Foundation which supports sports globally. 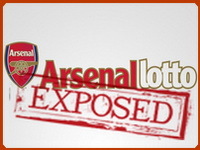 It appears it is endorsed by the Arsenal Football Club with a direct link to the lotto site. One of my probs with this lotto betting game is that there is no information on their site on how they guarantee they will be able to pay out any jackpot winners. Usually, this type of betting pool is guaranteed by an insurance company. That might be the way it works, but there is no information offered. Customer support is open Monday to Saturday from 8:00 am to 8:00 pm UK time. They also offer an email and snail mail address. Would you mind rating ArsenalLotto.co.uk ? Remember folks; this is betting on the German Lotto draw and not purchasing tickets. I’m not saying that you’re not going to win and receive that big jackpot, but I am a little cautious of the concept of betting on lottery numbers. Arsenal Lotto doesn’t get a thumbs up or a thumbs down. If you are an Arsenal supporter, this is a chance to combine betting on a lottery and supporting the foundation as well their monthly prizes. Me, I think I’ll stick to the big real jackpot lotteries where I’ve got my ticket when I say I WIN. Part of me thinks this is a great way to help fund a sports team. Then again, the whole concept of betting versus actual tickets come into play. There is no question, I would be more confident if I knew how they were funding or insuring any big win. Then again, I do love being able to bet on a lottery and support sports!